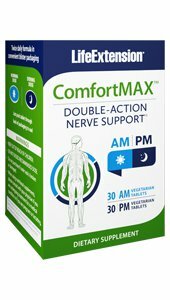 ComfortMAX® is a unique supplement that promotes nerve health and comfort by inhibiting inflammatory compounds in your nerve cells and encouraging healthy neurotransmitter levels in your brain, ComfortMAX® helps to reduce discomfort. Palmitoylethanolamide (PEA) is a unique kind of fatty acid. Your body naturally produces PEA as part of a healthy anti-inflammatory and immune response. In fact, PEA inhibits the secretion of inflammatory compounds from mast cells, a type of white blood cell. As we age, our number of mast cells decrease, causing our remaining mast cells to work harder. That can make them overly sensitive, activating inflammatory processes which cause nerve discomfort. In a randomized controlled trial following 636 patients over a period of three weeks, 600 mg of PEA every day profoundly affected scores that measured relative comfort and quality of life. In a smaller randomized controlled trial, patients reported that PEA outperformed standard care for discomfort after taken for two weeks. Honokiol is a naturally occurring lignan compound derived from several species of magnolia, several of which have been used in traditional Asian medicine for centuries. Scientists are discovering that honokiol has applications for nerve health and comfort. Honokiol has been shown to support the "calming" GABA receptors in the brain, which affects the way the brain perceives discomfort. Furthermore, honokiol is quickly taken up into the brain in animal models, making it an ideal ingredient for nerve health and comfort. DIRECTIONS: Take one white AM tablet in the morning and one blue PM tablet before bed, with or without food, or as recommended by a healthcare practitioner. Caution: The blue PM tablet may cause mild sedation in some people. Take at bedtime. Compiled from information provided by Life Extension. croscarmellose sodium, microcrystalline cellulose, hydroxypropyl methylcellulose, stearic acid, hydroypropyl cellulose, vegetable stearate, silica, maltodextrin, spirulina extract color, glycerin.